Monday, July 9th, 6-7PM. Ages 12+. 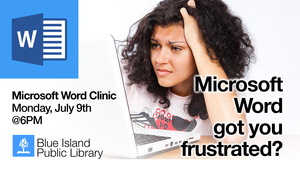 Microsoft Word got you frustrated? Come to our free clinic to get the support you need. Sign-Up for our Creative Communities Newsletter to stay up to date on all the latest topics to fuel your creative passion.